It is not uncommon to see images of saints on St. Joseph’s Day altars, but never have I seen a picture on the altar of the man who owned the Saints. 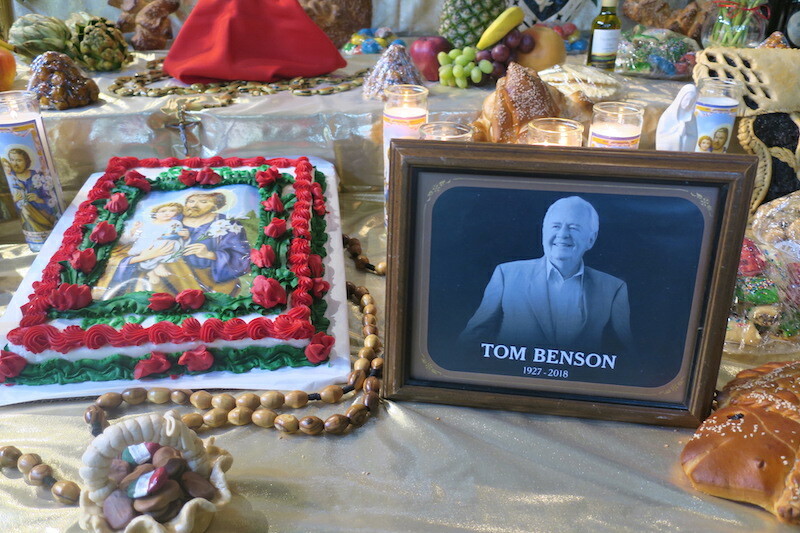 That picture, taken at St. Dominic’s church, reminded me of a brief conversation I had with Benson at his 90th birthday party last July. He was raised in the St. Roch neighborhood, where he attended Our Lady Star of the Sea Church. He and a relative talked about sometime attends 4 o'clock mass there on Sundays. Nothing unusual about that except they were talking about 4 a.m. mass, a time that was popular with fishermen on their way our out and revelers on the way in. Curiously that same week Edwin Edwards also celebrated his 90th anniversary. No one would ever associate Edwards with sainthood, but as governor he could make things happen. For whatever cajoling Edwards did, it worked. Benson, at the time a little known owner of car dealerships, put together a buyout group and plunged into the world of NFL football. He would soon buyout his partners and become sole owner of the franchise he has shepherded since then, building a success in one of the leagues smallest markets and being one of only a minority of owners who could rightfully wear a Superbowl ring. ​Benson celebrated his 90th birthday last year (July 12) at the same time that Edwin Edwards (August 7) was celebrating his. Both men were honored with big birthday parties; both men could look back at careers of major triumphs, occasional heartbreaks and having rejuvenated New Orleans in ways that only professional sports franchises can do. In 2012 Benson got another call, this time from David Stern – the commissioner of the National Basketball Association. We will assume that Stern did not have Edwards’ hutzpah but here again the effort worked. By most accounts Benson was not pleased when the Charlotte Hornets of the NBA first relocated to New Orleans, one day he would own the franchise, renamed The Pelicans. In the process made deals with the state that have revived downtown including an overhaul of the Superdome, the arena, Championship Square and the building now known as the Benson Towers. According to Forbes Magazine, Benson, as of March 2016, was worth $2.2 billion, putting him at number 288 on the magazine’s top 400 list. In a state short of the super rich, Benson’s money has been a vital economic development tool. In 2012 Benson and his wife, Gayle, funded a cancer recovery center at Ochsner Hospital. Personally, as well as through the Saints and Pelicans, Benson’s holdings have written many checks for community causes. Yet we hear this about the top: It can be lonely up there. Benson must have felt that loneliness in 1999 when on the day after a disastrous 3 and 13 season he fired everyone beginning with head coach Mike Ditka, his entire staff and the Saints front office. Fetch Monster, the kicking-tee retrieving dog, would also be banished from the roster. Benson was battered by the talking heads of sports coverage after that. He was viewed as being incompetent; the worst owner in sports. Yet, the move opened the opportunity for other people to become part of the operation. From the hole into which the team fell it seemed near impossible that by 2010 the Saints were at the top of the world waving a Super Bowl trophy. The evolution is even more implausible considering that during that period was the upheaval and uncertainty caused by Hurricane Katrina. Benson has had some rough moments since Katrina, including speculation, fanned by the Mayor of San Antonio, that he was going to move the Saints to that city. In fairness, there was a time when no one knew if New Orleans, much less the Superdome, would make a comeback. Benson received a lot of cajoling to do the right thing and it has paid off. Ridding of Ditka and the staff was one thing, in 2015 Benson in effect fired his family. No longer was he bound to loyalties forged by lineage and adoptions; now he could turn to those that he trusted. His wife Gayle Bird Benson is a class person. For all of their wealth, their most important possessions was that Tom and Gayle had each other. She was the one he trusted the most to maintain the integrity of the world he built, a world that in his last year would also include six-packs. It is not unexpected that a man having celebrated his 90th birthday would want to buy a beer. Benson bought a brewery and in doing so brought new energy to the old Dixie Beer label.